1. A complex system cannot be understood by examining its individual parts. For a complex system to produce “something” emergent properties must be present. By “something” we understand a recognizable behavior, form or pattern in the mind of the observer. The extension of this recognition, given the state of contemporary knowledge, exceeds now largely what is usually called the visible world. The very small, like molecules or DNA, to the very big, like distant galaxies or black holes, are now objective parts of our world although we cannot see them at the level of our perceptive organs. Our world is expanded. This kind of expansion doesn’t affect only perception. It changes cognition. Emergence is a property of some systems that produce a higher order, a whole, based on the interaction of its simple parts. It demonstrates “how things work” beyond the simplistic mechanics of cause/effect or the linearity of procedures. Actually, emergence is the main mechanism of natural phenomena. 2. 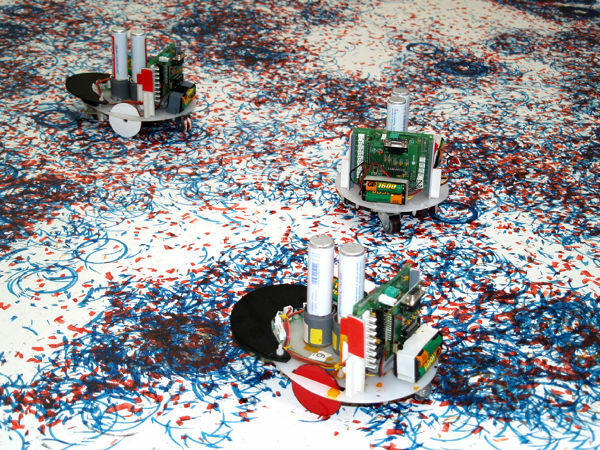 In 2003 I have created the first swarm of autonomous robots able to produce original abstract paintings based on emergent behavior. Each robot was equipped with two RGB color detection sensors, four IR obstacle avoidance sensors, a microcontroller and two actuators, one for locomotion and the other for pen manipulation. The microcontroller was an on-board chip, to which the program containing the rules linking the sensors to the actuators was uploaded. The collective behavior of the set of robots evolving in a canvas (the terrarium that limited the space of the experience), was governed by the gradual increase of the deviation-amplifying feedback mechanism, and the progressive decrease of the random action, until the latter was practically completely eliminated. During the process the robots showed an evident behavior change as the result of the “appeal” of color, triggering a kind of excitement not observed during the initial phase characterized by a random walk. This was due to the stigmergic interaction, where one robot in fact reacted to what other robots have done. According to Grassé (1959), stigmergy is the production of certain behaviors in agents as a consequence of the effects produced in the local environment by a previous action of other agents. Thus, the collective behavior of the robots was based on randomness, stigmergy and emergence. 3. The results of these experiments demonstrate that autonomous machines can produce a new kind of art. This new kink of art is nonhuman in essence, as once the human operator triggers the process he loses control on the outcome. The absence of conscience, external control or predetermination, allow creative machines to engender creativity in its pure state, without any representational, aesthetic or moral flavor. The essential of these creations is based on the machine own interpretation of the world and not on its human description. No previous plan, fitness, aesthetical taste or artistic model is induced. These are machines dedicated to their art. 4. In another approach a mesh of a 3d sphere was transformed freely by a mix of algorithms and in some cases an “ant algorithm”. The initial shape went through a set of unexpected and radical changes. Holes and spikes appeared deformations occurred. At a given moment the process was stopped and the output sent to a 3d printing machine. A while after an original sculpture was delivered. The essential of this work is done by machines. My role consists in starting and finishing the process. It may seem very important and some will see it as the inspired touch, the moment of “true” creation, but in fact it can easily be automated. We can imagine a chain of machines creating and printing continuously original sculptures without human intervention. 5. Humans and machines have a common history. We can regard a sharp stone in the hands of the Paleolithic man as a machine to make engravings and trigger abstract thought. Or, consider the Camera obscura, used by renaissance artists, as a machine to enhance realism and perform optical effects. However, today we have a new kind of machines that are more than mere tools. They are creative. With the advances on artificial intelligence and bio-inspired mechanics we can now state that some machines have a “will” on their own. They produce things that were not pre-determined in the algorithms nor assigned in the application design. In fact, a combination of stochastic processes and emergent behaviors can generate novelty. This changes radically the role of humans in a creative process when cooperating with machines, be it a simple computer or a sophisticated robot. The cooperation man/machine is of a symbiotic kind, stemming from a constant interaction and successive positive/negative feedbacks from both associates. The human triggers processes but is no longer the exclusive author of the outcome. Hence, concepts need a reevaluation. What means authorship in this new symbiotic context? Shouldn’t we redefine art when machines are also creative? 6. Recent years demonstrates a divide between the old humanistic vision that puts the human at the center of all things and the increasing machine autonomy. We witness an effective resistance to the unavoidable cultural change. However, the endeavor to make machines more intelligent, creative and even capable of some consciousness, is determined by need and is now unstoppable. We need that machines become partners and not just obedient slaves. This implies a change in machine skills but above all in human behavior. We need to upgrade our own contribution to the creative process. More than to do things we must concentrate in doing what does. More than to manufacture we should focus on processes that generate an autonomous and unexpected production. 7. Art is an exceptional field for the application of these ideas. Art is experimental by nature. Architecture is another important ground for change. Architecture is artificial by nature. Architecture is synthetic and increasingly determined by the extraordinary capacities of visualization and inventiveness of machines. In particular 3D programs generate new visions impossible to achieve by traditional means. And today digital fabrication, such as in 3D printing, is able to build directly physical spaces. An agenda for architecture should therefore be inscribed in a wider vision of the new conditions for creativity in the time of the emergence of Creative Machines. In conclusion I propose 3 principles for a new creativity. 1. Embrace a symbiotic relationship with machines. 2. Explore the power of imagination of machines. 3. Combine all creative processes generate by humans, other life forms and machines.